Annmarie Skin Care > Healthy Lifestyle > 11 Ways to Grow Long, Beautiful Hair… Fast! 11 Ways to Grow Long, Beautiful Hair… Fast! We’re skin people. Waking up to soft, glowing skin is what we're about. So we think of our hair as a picture frame for our nourished faces. It’s said that one can accomplish far more on a so-called “good hair day.” Those days where you wake up and your follicles are like an obedient classroom following your every order. It’s as if you went to the salon in your sleep. You feel like making eye contact with strangers. You ask your barista out on a date. Good things happen. And why can’t that be everyday? Check our list of tips and tricks to keep your tresses growing strong. If you don’t give your body the correct components, it won’t be able to give you beautiful hair. Your hair is mostly protein, so make sure to get enough, especially if you avoid animal products. Add beans or lentils to your diet if they aren’t already there. We recently posted a recipe for Moroccan Lentil Stew that is perfect for warming you during the winter months and giving you the protein you need to grow beautiful hair. 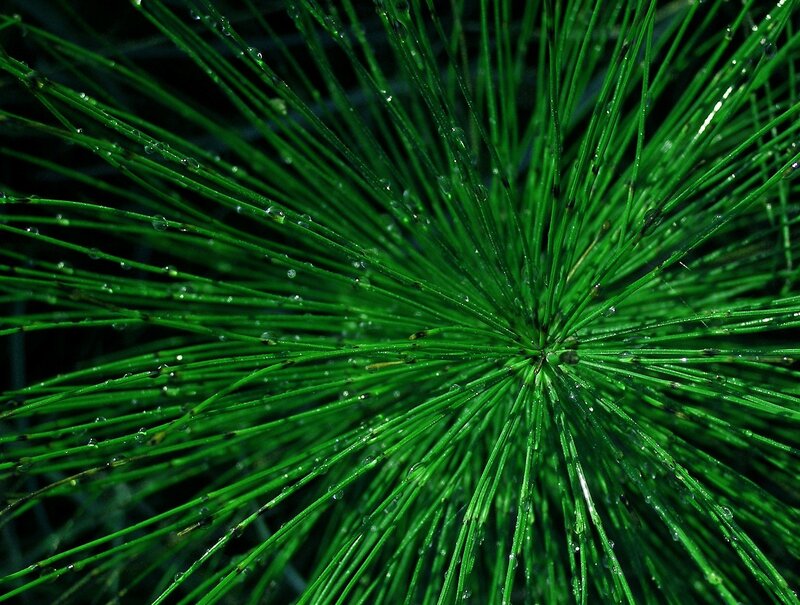 Did you know this plant converts inorganic silica to a form that we can use? This makes it one the best sources of silica on the planet! Silica is abundant in living creatures; without it, our bones would be brittle and slow to heal. It gives our hair luster and our skin softness. You shouldn’t consume raw, whole horsetail. It’s too abrasive. Use horsetail juice, tincture, or herbal tea to keep your hair (and nails) growing strong. You can even brew a strong pot and add it to your bath or use it as a hair rinse (more on hair rinses in a second). If you color your hair regularly, heat style often, and avoid regular hair cuts, you are probably aware of what ails your hair. But there are other, less obvious causes of dry, brittle, dull hair. Eastern medicine associates hair health with the strength of the kidneys and the blood. In Beauty by Nature by Brigitte Mars, she says that negative emotions such as envy and hatred can also diminish your hair health. Consider your overall mental and physical wellness when investigating how to grow longer and more beautiful hair. Tying your hair back with elastic bands can create tension on your scalp. The ones with metal pieces on them can irritate the hair and promote breakage. Try wearing your hair down more often to ease the pressure or use claw hair clips to put hair back without causing breakage. Use a brush with natural bristles that will absorb oils and thus help to evenly distribute them throughout your hair. Boar bristle brushes are popular, but for those who avoid using animal products, these simply won’t do. Be aware that often a product that claims to have “natural bristles” could be made with animal hair. Wood brushes are good alternatives, reducing static and helping to distribute those oils throughout your hair. You’ll also be avoiding adding more plastic to the world. Beechwood and bamboo are common natural hair brush options. Make sure to include lots of biotin in your diet. This B vitamin keeps hair growing beautifully. Grab some peanuts, sweet potato, eggs, or oats to get your fix. We like our facial oils, that’s for certain. We also love oils in our hair! Create your arsenal by choosing essential oils that help you achieve your hair goals. Massage a couple drops into the ends of your hair, add a couple drops to your shampoo or conditioner, add a couple drops to your hairbrush, or mix with a carrier oil and use it as a treatment. To brighten dull hair, use chamomile, lemongrass, or lemon oil. Nourish dry hair with carrot seed oil, lavender, or thyme oil. Oily hair benefits from basil, clary sage, or grapefruit oil. To heal damaged hair, use rosemary, sandalwood, or geranium oil. 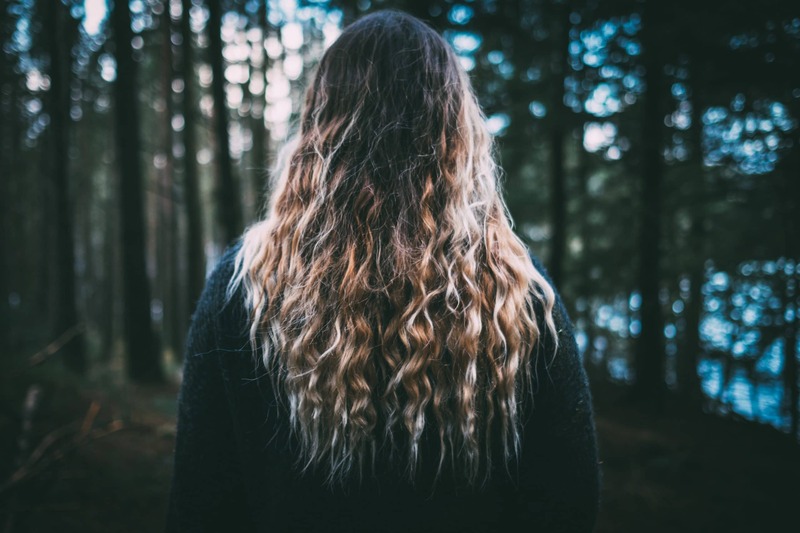 Many hair routines are finished after the conditioner is rinsed off, but you can work even more natural benefits into your routine. You can make a simple hair rinse by brewing a strong cup of tea (about ½ cup herbs to 1 cup of water) and storing the strained liquid in a bottle in your fridge. After rinsing out your conditioner, pour a cup or so of your rinse over your hair, and leave it in. Our Rosemary Toning Mist is loved by those with oily skin as a great way to soften while lessing clogged pores. Did you know that it’s also a great treatment for the hair? Rosemary stimulates, so a couple spritzes of this mist a day can help get you closer to mermaid hair. Many hair growth treatments work by stimulating blood flow to the head. There’s a really simple way to do this… be upside down! 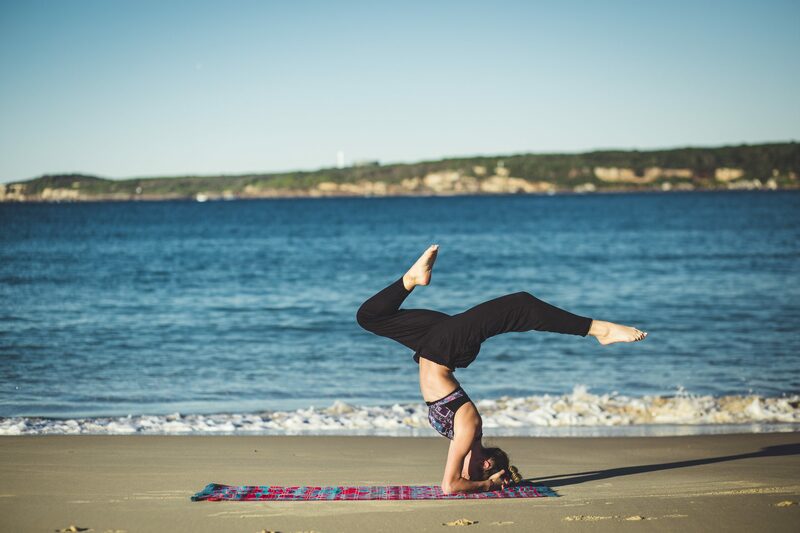 If you’re a yogi or a gymnast, do a headstand or handstand each day to get blood flowing. Alternatively, lay on a slanted surface with your head below the rest of your body to get the blood moving in that direction. Of course, we advocate for natural hair care in addition to natural skin care. You can’t expect your hair to thrive when you’re feeding it chemicals. Directions: Combine in a blender and apply to hair for 10 minutes or more, then rinse well. We hope you love these tips and how your tresses benefit from them! What's your secret for long, beautiful hair? Tell us in the comments below! I would love to have suggestions for a totally natural and nontoxic way to wash my hair. No poo methods such as baking soda or bar soap or liquid castile soap leave my hair looking heavy and lifeless, even after plenty of time to detox from health food store shampoos. Will your company consider making hair products? I absolutely love the face products you make and would love to see shampoo, conditioner and styling products such as a natural moose or gel made by AnnMarie. My secret for long beautiful hair is first, don’t cut it! Second, Condition, condition, condition! I love the idea of not tying your hair back, especially since I have been battling tension headaches, but I don’t know another way to wear it and not get tangled up. My hair is down almost to my knees but its very fine in texture. Any suggestions? Thanks for the amazing helpful tips!! Thanks for sharing this informative post!! I myself prefer to go for hot coconut oil massage once in a week for healthy hairs. Along with this make sure that you are using a good shampoo according to your hair texture. 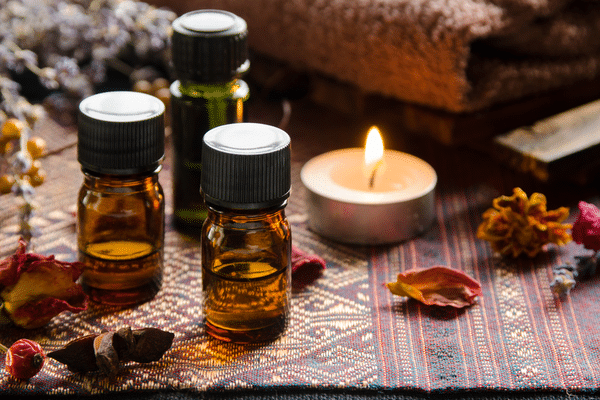 The Ashtanga Yoga community has what they call “Saturday Practice” – a castor oil bath. Castor oil reduces body aches and pain as well as being one of psychic Edgar Cayce’s go-to remedies for many conditions. It is also a powerful stimulus for hair growth. Thank you very much for the helpful tips, I’m using good product to keep my hair healthy, it’s pro naturals moroccan argan oil which is really good , helps to restore the hair and leaves it soft, shiny and healthy. Be natural is good. above tips was totally awesome i have tried it, i love it. Anyway, I tried just the nettle with essential oils and aloe) My gray hair became tinged with a yellow-green. I also read somewhere that nettle can also be a problem with cardiac issues. Should I just use rosemary on my hair before shampooing? My hair seems to pick up any color in herbs or oils. I’m trying to go as natural as possible, but all the shampoos out there for removing brassiness have harsh chemicals. Are there ANY herbal mixtures that would be good for me? Help! DO you have any scent free products? My tip? Be as natural as you can be. Weather (and your health) can change it, so be prepared to change your routine if you need to. If it’s dry and brittle, oil it. Rinse with herbs (chamomile for my lighter honey-coloured hair is good). And lastly, personally, I never colour it. I am happy to age gracefully and the grey in my hair is far less noticeable than a stark line of grey roots along your part! Horsetail is great but beware of misuse. It can raise blood pressure considerably!